I often speak of Monticello. From the moment I saw it, in an interiors magazine years ago, I was drawn to its grand Paladian presence. Its style, its symmetry and its classic sophistication have been a consent source of inspiration for me, throughout my carreer. Monticello was the primary plantation of Thomas Jefferson, the third President of the United States. Jefferson began his work on Monticello when he was twenty-six years old, drawing from knowledge gleaned from various books as there were no schools of architecture in colonial Virginia. Originally styled as a plantation, the first Monticello was slightly more modest — built in 1768, it was two stories high with a total of eight rooms. As the years went by, and especially after his tenure in Europe, he continued to add rooms, and make inspired changes. By the end of its construction Monticello was a grand villa, comprising 11,000 square feet. 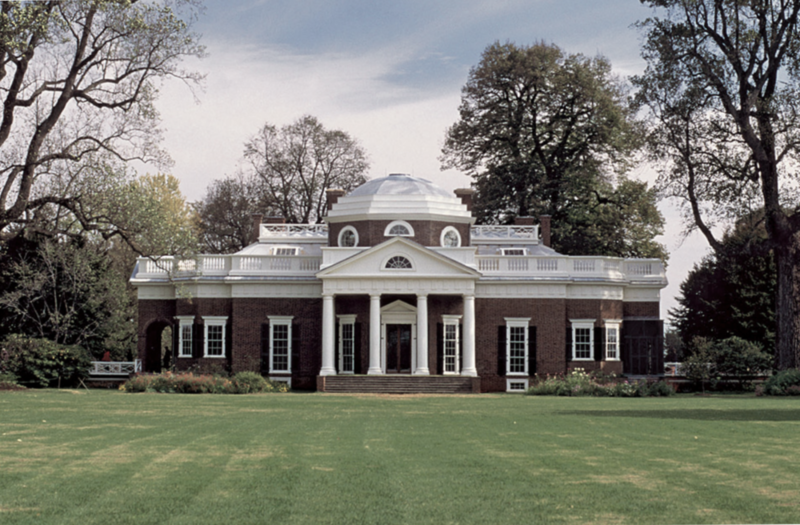 Influenced by Andrea Palladio, the Renaissance architect, Jefferson put his own spin on neoclassical architecture, incorporating octagonal forms in his designs which were often constructed in red brick. He created a style of architecture befitting a new nation – original, but drawing elements from European Classical tradition. Monticello contains a few ingenious innovations by Jefferson including a “turning machine” for holding clothing, a spherical sundial, and a revolving bookstand for his ever-expanding collection. It’s probably one of the most fascinating homes in the United States, if not the world. Not for it’s lavish decorations or its grandiosity, but more so for its perfectly symmetrical design and the intricate details that can be found in every room inside the house. Just like George Washington’s Mount Vernon, Thomas Jefferson’s Monticello sits on a hill with amazing views of the surrounding farmland, valley, and mountainous region. On a clear day, you can see for miles and gaze at the hilltops of the nearby Blue Ridge Mountains and Shenandoah National Park. There are only a handful of locations in the United States that are selected by UNESCO as World Heritage Sites and Monticello is one of them. It’s the only presidential home with such designation, and it certainly deserves it.